2019 Graduating Class Slogan: Our future is looking serene, we're the class of 2019! Celebrate the joy of this special occasion by sending out an outstanding graduation announcement. With our wide variety of sizes, shapes and styles, you are sure to receive an A+ from all family and friends. Some of our graduation cards have matching rep cards. 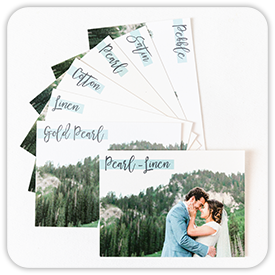 These fun small pass along cards, 1.5"x3.5", are a great way for seniors to stay in contact with their friends after they graduate, personalized with favorite photos and contact information. Put an end to boring graduation announcements, this is a one of a kind, special occasion, get and amazing card that really showcases you and your accomplishments. Everyone is sure to be impressed. Don't be square, take it to the next level with a fancy shaped die-cut card. These cards really change the game. We have many inspired shapes with a few new ones for 2013, Elegance, Milan, and the sure to be popular, Classic with it's simple lines and inverted corners. Already have your card designed? Use our Ploppers to simply send us your card. Custom designs take 2-5 days to create. We offer the most incredible paper options for your cards. These illustrious papers will really add depth and feel to your amazing photos and designs. All double sided and folded cards are printed on thick cover stocks with many papers being double thick cover for the most luxurious feel ever. 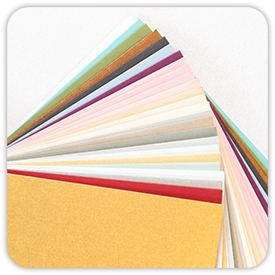 Pick My Paper is an option that will allow our technicians to choose the best premium paper for your card. You can add comments during checkout as to papers you may or may not want as well. We cannot reprint your order with this option, requesting a proof is recommended. *Go ahead and print! Paper is a biodegradable, renewable, sustainable product made from trees. Growing and harvesting trees provides jobs for millions of Americans. Working forests are good for the environment and provide clean air and water, wildlife habitat and carbon storage. Thanks to improved forest management, we have more trees in America today than we had 100 years ago. We carry a few great envelopes to go with your cards. 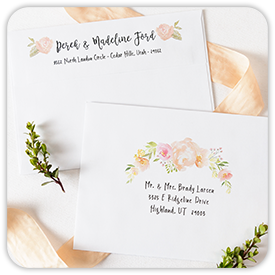 Matching Pearl, Linen or Pearl-Linen envelopes really bring it all together. We can also get many other colors to match your cards. Let us save you some time by having us print your return address and/or mailing list on your envelopes. In order to print your mailing list, you must download our sample excel file and fill in the addresses. There is a $10 set up fee per mailing list provided. Please email us what is to be printed on your envelopes (including return address, mailing list, and font name). 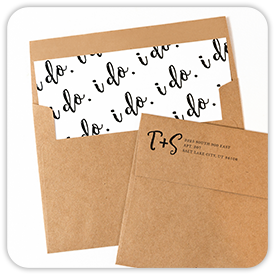 Create matching envelope liners to go with your announcements, or we can custom create them for you. Liners really add a custom touch to your announcement. Easy to assemble and come with glue dots. Just slide in and glue. We can put rounded corners on your cards to add a smooth look and feel. Works great on flat and folded cards. This is a great way to stand out from the rest, all your friends will be jealous. *available in 1/4" and 1/2"
When I choose to see a proof during checkout, what does that mean? If you choose to see a proof, this means that we will print and mail you an actual printed proof so that you can see exactly what your card will be like. We do not email digital proofs, as our website shows bleed lines and folds when you order. 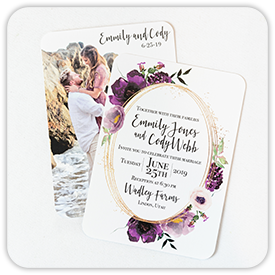 If you have a custom design created, we will email digital proofs with the option of a printed proof after you have approved the digital proof. Once a proof is approve or order placed without requesting a proof, it cannot be reprinted for any reason! Proofs are free on orders of 50 cards or more. If you order less than 50 cards, there is a $5.00 fee for your proof. How do I know which paper to choose for my card? This largely depends on your personal preference and which papers you like, but we do have a few recommendations. Lighter colors and background will show off the shimmer effect of our pearl papers, while dark colors or designs are better on the other papers. Many of our paper are very thick, so some cracking should be expected if you run your images or designs over the folds. What is sRGB and why do my images have to have it? All file MUST be in RGB mode (not CMYK, grayscale is okay) and use the sRGB profile. Any other profile will give undesired results as the colors will not be printed correctly. When it comes to color management and printing there are a few options depending on the end result desired. For photography and photographic labs, sRGB is the preferred workflow for great color and skin tones. All printers that are used at Pro Digital Photos are setup to properly accept and print sRGB images correctly. We are not able to check every file we print, so please submit them with the correct profile as we cannot reprint orders that were not submitted correctly. Why do my images look bad or pixilated when I drop them in your templates? This is because we only upload a preview of your image for faster ordering and easier zooming and cropping of your images. Don't worry your full, high resolution images are sent at the end of the order process. I can't get your ordering system to load or upload my images, is your site down? If you are totally stuck and have tried all these things. Please give us a call at 801-785-7432. We can remotely connect to your computer and help you troubleshoot your system. Yes! We can easily print your return address on the back flap of your envelopes. Please be sure to put the exact text you want in the comments during checkout and any fonts you may want to use. Otherwise will will choose the fonts for you. We can also print your mailing list on your envelopes and save you a lot of time. You will need to download our excel template and put all your addresses in the correct format. Then you will email the list to us and let us know what return address you would like and any fonts, if any, you would like to use. What is your copyright on your designs and templates? All designs created by Pro Digital Photos, including custom created designs, are copyrighted by Pro Digital Photos and may be used in marketing and advertising. All templates and designs by Pro Digital Photos will have our web address in the card design. We try to keep the web address small and discreet so it does not detract from your card. We can remove the web address from holiday cards for a nominal fee. We have amazing templates to make it fast and easy to get your announcements done. Simply choose one your like, put your photos and text on it and you're done. Freestyle layouts are blank cards that you design from scratch. We do have some background patterns and great fonts to help you make a good card. Be aware that this is a LIMITED design tool and depends on your computer configuration to work properly. If you are easily frustrated, or lack patience, please let us create your announcement for you. Our incredible designers will get you exactly what you want. Get that special design you've always wanted. Submit your photos and layout ideas, including colors and fonts you like. Creating your own layout can be time consuming and complicated, let us do all the work for you!! Include the layout instructions and text for your announcement in the comments area in step 2, then checkout.